Printable Word Family Picture Spinners – includes spinners for simple word short vowel word families / cvc words. Thanks to Jessica for suggesting this resource…. all CVC / 2 letter word families for short vowels. 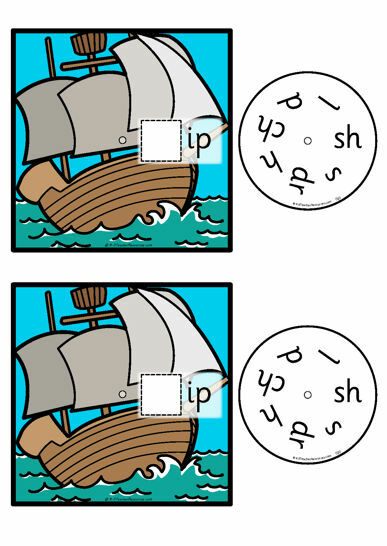 Smaller black and white or colour versions are ideal for each child to make up individually. Have each of the large coloured versions laminated and on hand for whole class activities and reference. Smaller black and white or colour ones are ideal for children to make up themselves – great as a reading group activity. Use the blank spinner templates to create further spinners eg. even higher level ones – eg tion – ac/tion, protec/ tion, men/tion etc etc. Question the children before spinning – if I spin a ”f” will it make a ”real” word? What if I spin a ‘m’ what word will it make? If I want to make the word ‘mat’ – what letter do I need to land on ? Match the spinner words with the word family / cvc word cards and pictures. Can’t download the ‘u’ set. The link keeps taking me to the Home page not the PDF. Does anyone else have this problem??? Love this resource! But … the ‘ib’ box doesn’t show up on the small coloured set.